Do whatever’s right « Hercules and the umpire. Donald Ross repeatedly did whatever was right. At 21, he was a bombardier over Germany with the 306th Bomb Group of the 8th Air Force. By 31, he had finished law school and served on the City Council in Lexington, Neb., and was its newly elected mayor. Just a few months later, he was named Nebraska’s U.S. attorney. Before he turned 50, he was appointed as a judge to the 8th U.S. Circuit Court of Appeals. 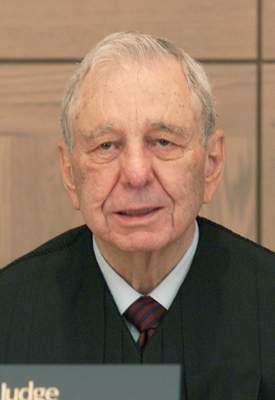 His law partners at the time gave him a judge’s robe that was embroidered inside with, “Do whatever is right.” He was known for saying that to colleagues and family. Ross, 91, died Wednesday at his Omaha home after a long illness, said daughter Joannie Wilson of Omaha. “He was larger than life. He had a big smile and a big laugh and a gigantic heart,” she said. He had four rules: Houses are brown. Cars are blue. Dinner at 6. Do whatever’s right. “He was a very remarkable man,” Wilson said. Ross entered the Army Air Corps in October 1942. He flew 46 missions as lead bombardier with the 306th Bomb Group. The 306th was the first U.S. group to bomb Germany, inspiring the book, movie and television series “Twelve O’Clock High.” Ross twice was awarded the Distinguished Flying Cross and left military service as a major. President Richard Nixon appointed Ross to the 8th Circuit in 1971. Ross replaced Harry Blackmun, who was named to the U.S. Supreme Court. As a judge, Ross told The World-Herald in 1987, he regarded himself as “moderate in civil rights cases” but “very conservative” in criminal cases. Ross received the Herbert Harley Award from the American Judicature Society, a national organization of lawyers and judges, for his “outstanding service in promoting the administration of justice.” That award is the top one given by the society. He was born near Orleans, Neb., and grew up at Curtis, Neb., where he graduated from the Nebraska School of Agriculture High School. Military service in World War II interrupted his education at the University of Nebraska. He graduated from the NU College of Law in 1948. He practiced law for five years in Lexington before President Dwight D. Eisenhower appointed him as U.S. attorney for Nebraska. Ross, who moved to Omaha, served in the post from 1953 to 1956. He returned to private practice and became vice president and general counsel for ConAgra. Before his judicial career, Ross was active in state and national Republican politics. He was Republican National Committeeman for Nebraska from 1958 to 1970 and vice chairman of the Republican National Committee from 1965 to 1970. Other survivors include his wife of 70 years, Janice Cook Ross of Omaha; daughters Jane Moody and Sharon Stephan, both of Lincoln, and Rebecca Ross of River Forest, Ill.; son Dean Ross of Omaha; 14 grandchildren; and 17 great-grandchildren. The family will hold a private service in Omaha before Ross’ inurnment at Arlington National Cemetery. The court will plan a memorial service for him at a later date. By Sue Story Truax / World-Herald staff writer, published by the Omaha-World Herald on Saturday, December 21, 2013.